I started working at Push in April 2015 as VP of Sales & Business Development. My role at Push is to grow the business by aligning with the right partners and bringing on new customers. After many years of working in telecommunications, and most recently with a software company, it was clear to me that joining Push would be the right transition, as it integrates smartphones (and tablets) with cutting-edge technology. Why did join the field of Sales and Business Development? I’ve worked in sales and business development for over 15 years, and throughout that time I’ve had a strong passion and sincere interest in connecting my clients with the right solution to meet their needs. The idea of mobile apps is still fairly new for many businesses and is often still perceived as a luxury item versus a must-have. But after having a conversation with us, a business owner can truly see the value in having a mobile app customized for their business. It no longer becomes a nice-to-have, but a necessary and an essential tool to stand out from their competition and keep up with the changing times. This challenge in overcoming the “nice-to-have” belief is precisely the reason I enjoy the field of sales; it presents me with an opportunity to show our value to a customer, and consequently help them with their business. What type(s) of areas do you specialize in, any related experiences you want to discuss? In any sales position, developing a relationship with the client is one of the key underlying factors in being successful. I pride myself on my ability to establish and maintain good quality relationships with our customers. Developing these relationships takes time; you have to build rapport, and it’s important to really listen to your client’s needs. In my entire professional career, I have always focused on under-promising and over-delivering. In doing so, I’ve been able to build a history of strong credibility, and my client’s can trust that I will look after their needs. I think this is one of the reasons why many of my past customers still keep in touch with me today, and have even become close friends of mine. I enjoy working for a company that provides a service or product that I truly believe in and can stand proud behind. Push Interactions does just that. One of the things that really impresses me is that Push won’t release an app until it is has been exhaustively and thoroughly tested inside and out. Push will not cut corners to release an app sooner, or with missing features. The entire team at Push is committed to only releasing a superior product that a client is fully satisfied with, and that lines up well with my own principles and beliefs. Whoever said that when you have kids you say goodbye to spare time, wasn’t kidding! Besides splitting chauffeur duties with my wife for driving our two boys to soccer practice, Taekwondo, basketball, piano, and swimming, it doesn’t leave me with much spare time. But somehow I manage to squeeze in some daily exercise, including weightlifting, cardio, and a round of golf and tennis every now and then. Gurinder has vast sales and management experience in the telecommunications world. 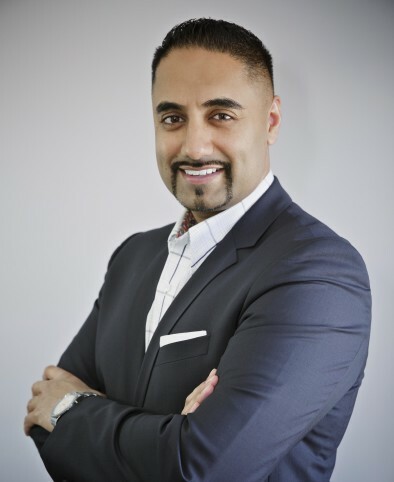 Over the past 15 years, he has worked at Bell Mobility and BlackBerry, and has a specialized focus on driving sales through channel engagement with the leading wireless carriers in both Canada and U.S., including TELUS, AT&T, Verizon, Sprint, and T-Mobile. As VP, Gurinder is focused on sales, and developing the company by forming strategic alliances with the right partners.